Recently we had the chance to get our hands on the Alpinestars Frontier All Season Jacket for a bit and we were pleasantly surprised with how it stacked up to its ADV focused competition. Besides having some great functionality for sport and adventure touring as well as coming in a High Visibility color option, the addition of GORE-TEX for weatherproofing was a much desired feature which really does set it apart. At RevZilla we service the long distance and adventure touring riders on a regular basis and we frequently get asked about Gore-Tex among other wishlists of gear features. Aero-Stich has been using Gore-Tex for years, but those suits are tough to get a hold of. Also BMW had the Gore license for the last few years but just recently lost it to REV'IT! who will be launching their top tier GORE-TEX line in the fall of this year. For most manufacturers, including GORE-TEX means increased cost due to the fact that W.L. GORE gets involved in the manufacturing of the products using its materials and basically makes sure that the overall quality of the garment lives up to the GORE standard. This involvement in the process adds time and costs to new product development and sometimes can end up making the final product prohibitively expensive. Hence we usually see a lot of manufacturers with their own type of waterproof / breathable membrane to help keep cots down. In our opinion these proprietary membranes perform well but are ultimately not as good as the original GORE-TEX technology. So I know I am rambling a bit here, but I will get right down to it - its impressive that Alpinestars, who does so many things well, would take the time to listen to its customer base and develop an extremely targeted all season jacket which lives in the same realm as the ADV focused REV'IT! 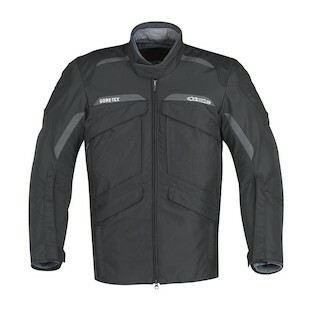 All-Season Jacket line as well as some of the top end textiles from Dainese like the D-System Jacket. Please see a full list of features below, but remember no expense was spared when developing the Frontier. Also I must say that after wearing it, I found it to be comfortable and have a nice athletic cut to it which is in tune with the European style Astars is known for. Please watch the HD video of the Alpinestars Frontier Jacket for the full run down and remember this motorcycle jacket was not manufactured to be the everyday coat for everyday. The Frontier was built to be an apex product for the harshest of conditions. If you can not tell already, I was impressed. I applaud them for taking a chance in segement of riding they are not known for and executing really well. Looking forward to riding the Frontier a ton this Spring. I want to know more of this jacket, also the frontier pant, it would be great to see another video of these two. Thanks.